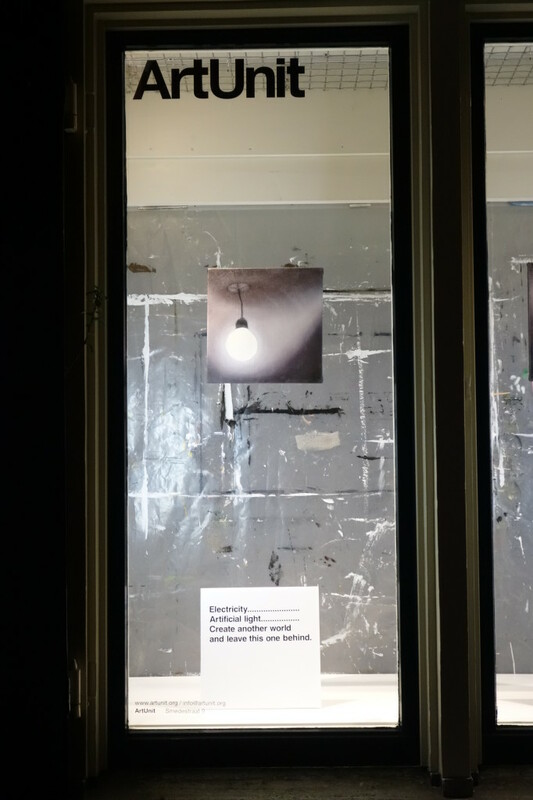 For the month of March, 2014 , Art Unit (Haarlem, The Netherlands) is showing an installation of my work which consists of two small paintings, suspended in front of a sheet of plastic that came from my studio, and two signs with written texts. ArtUnit was launched in 2004. This window-gallery is an initiative of Chrystl Rijkeboer, who is an artist herself. 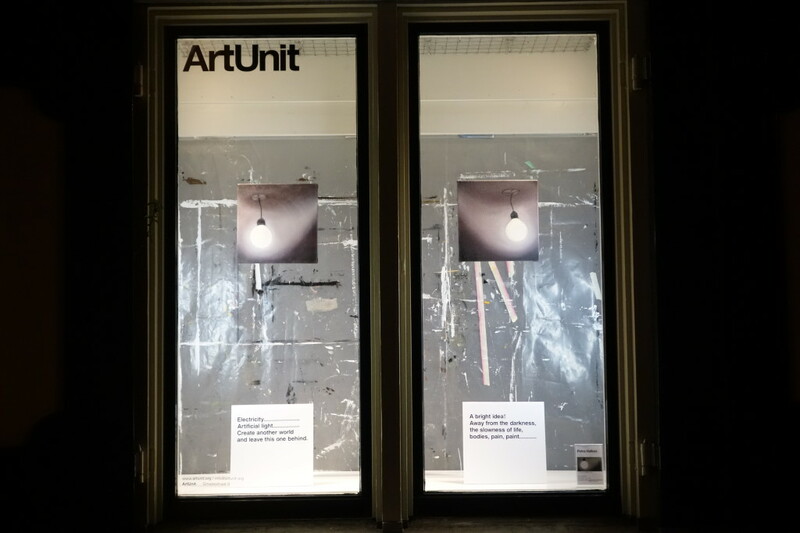 ArtUnit is a non-profit contemporary art gallery which encourages artists in their art practices, explorations and experimentation by offering them an alternative place to show their work in the city centre of Haarlem. Each month ArtUnit will show work of a different artist. So Many Suns (2013) is a series of paintings that portray single lights. Drawing away from the dazzling cityscapes of my previous paintings, here I focus on the light bulb as the origin of the electric lightscape. This could lead to sobering thoughts, reflecting on lifestyles and use of the earth’s resources. Conversely, thoughts could go to the beauty of the light, to the mandala, the halo, the sacred circle. These lights could be taken for wonders, they could be seen as signs of wholeness so lacking in the spectacular, bewildering city at night. 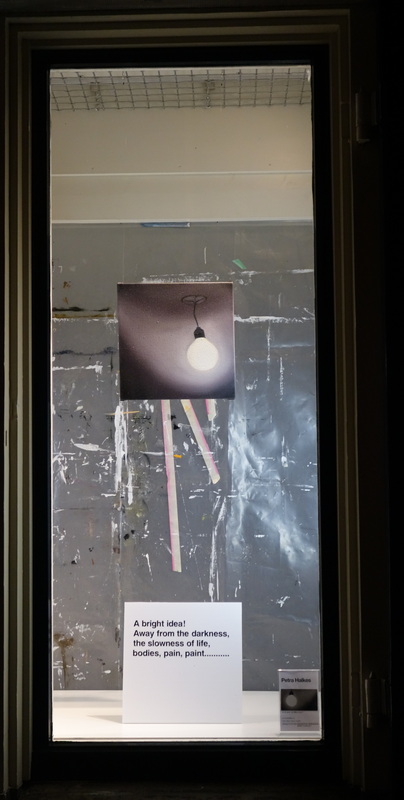 While the glowing lights in my work admit to a desire for transcendence, I bring this desire down to earth by representing light through such mundane subjects as electric fixtures, and by using paint that in its very physicality undermines dreams of transcendence.